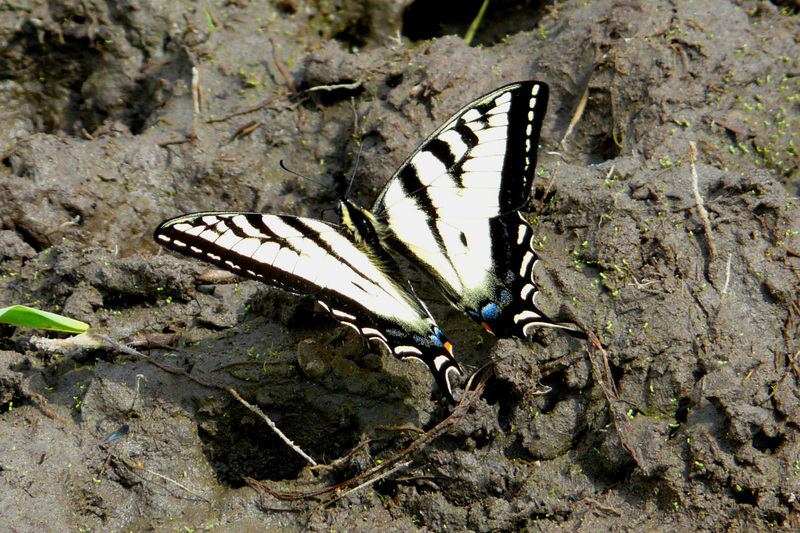 While late July is normally pretty slow birding in the Willamette Valley, the Sandy River Delta continues to be active. The regular nesting species that are local specialties at this site (Yellow-breasted Chat, Lazuli Bunting, Willow Flycatcher, Eastern Kingbird, etc.) are still easy to find. A very vocal Indigo Bunting has been a rare treat the past week or so, and an even rarer Yellow-billed Cuckoo has been reported. On my recent visit, I enjoyed brief views of the bunting, but the cuckoo has not been relocated. This Yellow-breasted Chat was singing away in the blackberry thickets. He stayed out of sight most of the time, but popped up briefly for a distant photo. 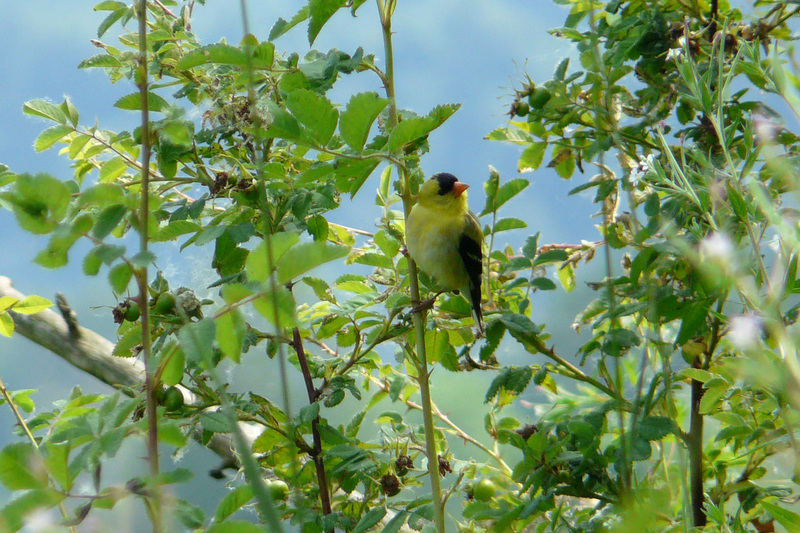 American Goldfinches were common in both the grassy and brushy habitats. 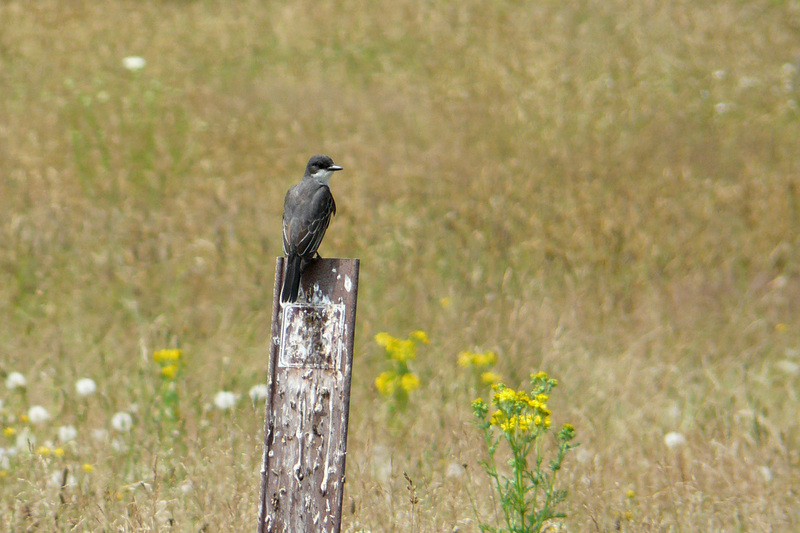 An Eastern Kingbird was using this pipeline marker as a hunting perch in the middle of a large grassy area. 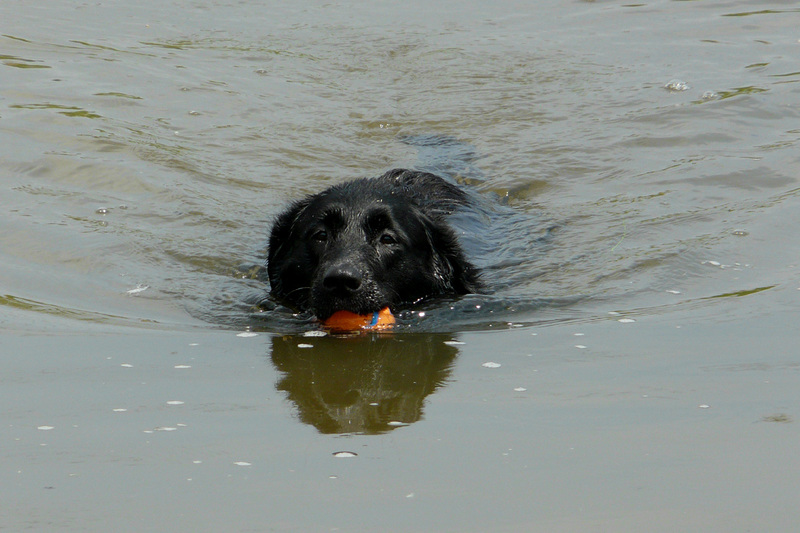 Water levels are dropping, so Nala’s pond will soon be too shallow for swimming. But the the Sandy River has dropped enough to be accessible now, and the water in the river is a lot cleaner than the brown pond water. 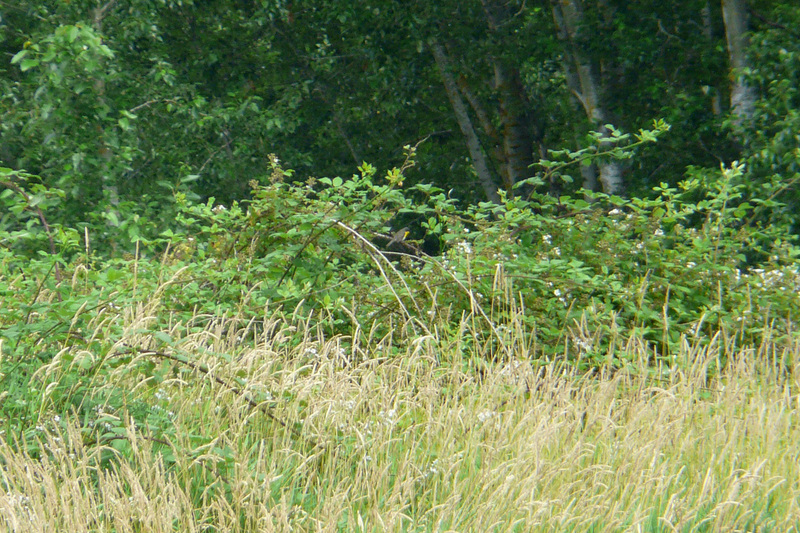 This entry was posted in OR Birding Sites, seasonal movements and tagged American Goldfinch, Eastern Kingbird, Sandy River Delta, Yellow-breasted Chat. Bookmark the permalink. Nice post! I’m heading out there tomorrow with Laura and Jen. Wish us luck! Nice to see Nala enjoying summer! It was amazing there last week. I’m impressed you got a photo of the Yellow-breasted Chat. We saw and heard a few but couldn’t get any to pop out for a photo op. Your pup looks blissed out.